Is it time for you to move? Affordable mortgages and downpayment assistance for many residents of North Carolina. Is it time for a new home? Are you afraid that you don’t qualify for a loan; or you don’t have a down payment; or you won’t make any profit on your current home? I can help. 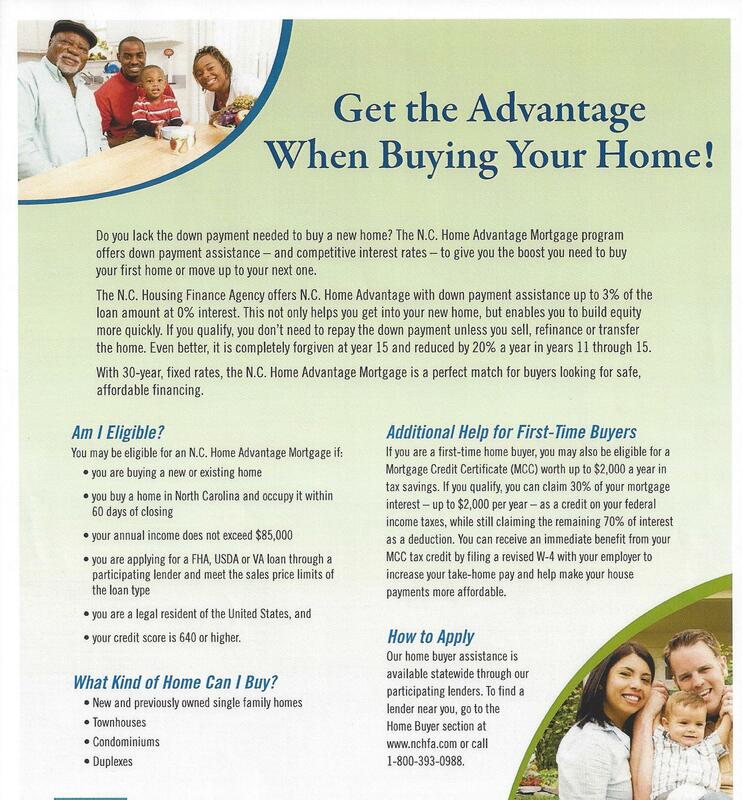 The North Carolina Housing Finance Agency is now offering down payment assistance to many more real estate consumers. ***Do you earn $85,000 or less? ***Do you have a credit score of 640 or better? ***Are you a legal resident of the USA? You may qualify, call me today, I can help. My friend Chris Holt with FM Lending is a participating mortgage lender. His telephone number is 919-416-2225, make sure you mention my name when you call him. For Rent: 2BR/2BA Condo in Durham, NC, $825/month. For Rent: 2BR/2BA Townhouse in Durham, NC, $1,000/month. In order to achieve a degree of success and aptitude in any business it is essential to have the correct tools and resources in place. Additionally, to have the correct processes in place is vital too. Crisis management is not management; it is at its essence being managed. For nearly twenty years I have sold residential real estate in the Raleigh, Durham, Chapel Hill; greater Research Triangle market. During this tenure I have worked diligently to build a network of resources like bankers, insurance agents, lawyers, home inspectors, contractors and engineers just to name a few. I have also affiliated myself with Fonville Morisey Realty, a Long and Foster Company, which has superb training programs, an efficient and knowledgeable management team, professional support staff, an in house lender and an in house title insurance company. Fonville Morisey also employs well over 500 REALTOR/agents who bring a wealth of experience and knowledge to the corporate table. In the last three years my team, Team Michael Sullivan, and I have worked diligently to build a property management business aside from Fonville Morisey in order to offer our clients the ability to one stop shop for their real estate needs. My team and I realized that in this down economy it might not be the right time for all owners to sell property. Some owners might want to hold on for a few years until the market rebounds and perhaps their principal has been paid down. Selling at a loss just isn’t an option for many folks. We believe as a core principal that the time has to be right for a client to sell or buy and that only the client can dictate that timing. As for my team’s tools of the trade, they are consistent and constantly developing. We maintain a state of the art blog to disseminate vital market information to the communities in which we work. We maintain a professional web site that allows us to comprehensively market our listed properties. We subscribe to a state of the art listing database, Triangle Multiple Listing Service and to an excellent, cloud based, property management software Buildium. To market our properties my team and I use direct mailing, a professional photography service, virtual tours, blogging, telephone calling to other REALTORS, open houses when deemed appropriate and we subscribe to an excellent network of relocation companies. The final essential component to our home renting and selling arsenal is market knowledge. Since we work with both home buyers and home sellers as well as with renters and landlords my team and I spend countless hours every week working within our real estate market. Admittedly we don’t know everything and to that end we work six days a week year round, in the Greater Research Triangle Market to continually learn and broaden our scope of real estate knowledge. We also spend countless hours building systems to ensure a smooth sale or rental experience. We are full time real estate practitioners; we’re not in this business part time because we believe that would be a disservice to our clients and customers. agents job is to empower them with solid information.